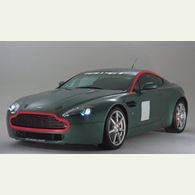 (autoinsidernews) - Aston Martin has teamed up with Prodrive to produce a very special rally car, the Aston Martin Rally GT. The Rally GT is a specially prepared Vantage V8 that has been extensively re-engineered by Prodrive, including a Prodrive-designed roll cage, competition Eibach springs, and three-way adjustable EXE-TC dampers to go with the stock wishbones. The engine in the Rally GT is based on the stock 4.3L V8 engine, tuned for more flexibility and responsiveness, and delivers 420bhp. Aston Martin Racing will product a limited number of Rally GTs with the first cars being available at the end of 2006, reports Trend. More photos and press release after the jump.